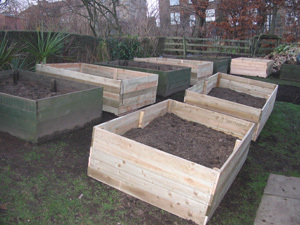 There are many benefits to using raised growing areas when starting up and developing your vegetable growing area. To start you need to decide how big a bed and what shape a bed you want to make. This can depend on the area or corner that it is going into. I usually find that a 1.8 x 1.2m is quite a good size. 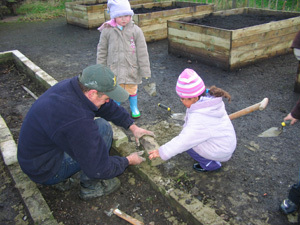 The gardening club's work in the local community at Haworth has become such an important part of community and school life. 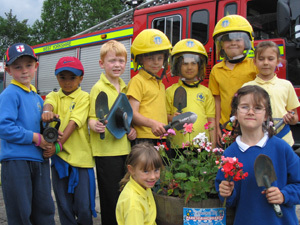 It is as though the school is now the centre of the community, leading the village in such things as it's entry into the Yorkshire in Bloom competition for which it gained Gold Standard last year. I have talked about how the introduction of the vegetable growing area had opened up so many windows for everyone at Haworth Primary School. 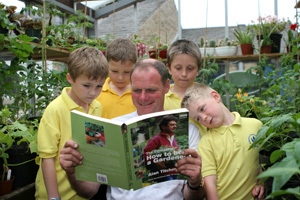 Well the thing that really put us on the map and gave so much inspiration to so many other schools throughout the country, was when the children started taking the produce that they had grown into the school kitchen and eating it as part of their school meals. 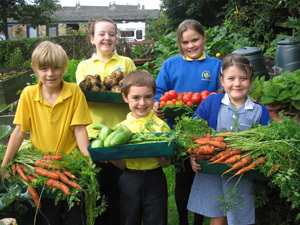 The introduction of the vegetable growing area had opened up so many new windows for everyone at Haworth Primary School. 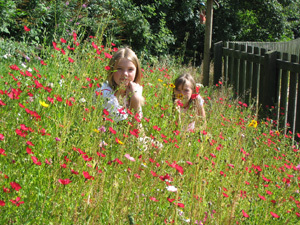 Well the development of the nature garden had the same enormous impact, especially on the amount of curriculum work that can be done in such an environment. Things go a little quieter in the winter, but I am going to show you a few things I do at the sessions I run at this time of the year. My biggest challenge when running these sessions is keeping the cost down as the organizers are usually working on a fairly tight budget. All the children at the new schools I have been working with during the past year are now becoming quite little gardening experts so I am starting to go into a little bit more depth. I think this is the time to do the same with your new or established projects. So here goes. At the start of the session I go round the class getting the children to name as many fruits or vegetables they can grow at their school or project. I then hand seed packets out for them to pass around so they can put a picture to all the names.